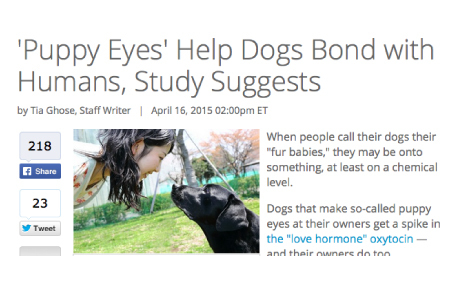 In this article, an experiment showed that human/dog pairs release oxytocin whereas between dogs? Not so much. It would seem that it’s a “dog-eat-dog” work amongst dogs, but when they are looking to be adopted and cared for by humans, they have co-opted the infant-parent cuteness that keeps us from abandoning our own young. Dogs have the exact same telomerase mechanism as humans and are a wonderful example of how telomerase activation can enhance their lives, even with life-threatening cancer. In this video, we get to know Lulu and how she bounced back from metastatic osteosarcoma for a very long time while using an adaptogenic telomerase activator.